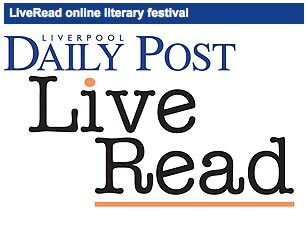 The Liverpool Daily Post will run its own online-only literary festival from 15 March. The LiveRead festival will run from 15-19 March and feature liveblogged chats with authors and live writing workshops with Merseyside writers. The Post is also tapping into its community of Flickr users by asking them to submit images of reenactments of their favourite literary scenes. As part of the festival the Post will also use online storytelling tools Xtranormal and Storybird to encourage amateur writers to create their own multimedia stories. 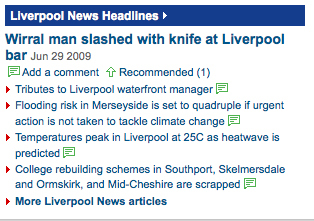 This entry was posted in Online Journalism and tagged #liveread, Liverpool Daily Post, local and regional media on March 5, 2010 by Laura Oliver. David Bartlett, Liverpool Daily Post and Echo city editor and has written several stories criticising Liverpool Direct Limited (LDL), a joint venture between Liverpool Council and BT. But it was his post about the company’s ‘christmas’ gifts to its staff (branded ‘LDL is a great place to work’) that has reportedly got his blog ‘Dale Street Blues’ banned from the company’s computers. This entry was posted in Editors' pick, Newspapers and tagged david bartlett, Liverpool Daily Post, Liverpool Echo on December 8, 2009 by Judith Townend. Who? Deputy head of web and data at Liverpool Daily Post and Echo. What? Has been a journalist since 1995 after graduating from the University of Central Lancashire, contributing to weekly and daily titles. Spent a year working in NHS PR. Specialities include newspaper and magazine design, sport, and internet development, especially journalism blogging. This entry was posted in Recommended journalists and tagged #followjourn, head of web, internet development, journalist, Liverpool Daily Post, Neil Macdonald, nhs, University of Central Lancashire on September 1, 2009 by Nora McKeogh. It was an ‘oversight’ that Madeleine McCann related keywords were included in the metadata for every main local news story on the Liverpool Daily Post site, a Trinity Mirror spokeperson said, after Journalism.co.uk informed the company that the terms were present in the ‘hidden text’ of a series of unrelated news items. The automatic inclusion of the keywords “madeleine mccann, madeleine mcgann, kate mcgann, kate mccann” in the HTML for Liverpool news stories has now ceased. Journalism.co.uk learned in May that specific keywords, including those above, were used in the metadata for the ‘Liverpool News Headlines’ section on the Liverpool Daily Post site, regardless of the story’s relevance. This continued for at least one month before it was drawn to the Post’s attention on Monday (June 29). 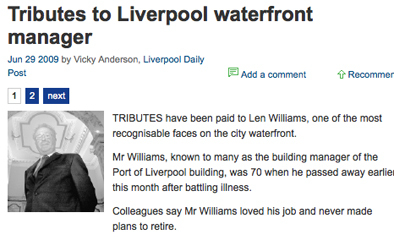 A story about Len Williams, a well-known waterfront manager who recently died. “‘Keyword stuffing’ refers to the practice of loading a webpage with keywords in an attempt to manipulate a site’s ranking in Google’s search results. Filling pages with keywords results in a negative user experience, and can harm your site’s ranking. Focus on creating useful, information-rich content that uses keywords appropriately and in context. “To fix this problem, review your site for misused keywords. Typically, these will be lists or paragraphs of keywords, often randomly repeated. Check carefully, because keywords can often be in the form of hidden text, or they can be hidden in title tags or alt attributes. This entry was posted in Newspapers, Online Journalism, Search and tagged google, html, Journalism.co.uk, keyword stuffing, keywords, Lammo.net, Len Williams, Liverpool, Liverpool Daily Post, Madeleine McCann, Nathan Campbell, search engines, search results, SEOs, sister site, spokesman, The Liverpool Daily Post, the HTML for Liverpool news, the Liverpool Echo, Trinity Mirror, waterfront manager on July 1, 2009 by Judith Townend.